The flow in supersonic wind tunnel diffusers is usually transonic in nature, and the formation of a normal shock just downstream of the diffuser throat region is required for power economy. The behavior of this starting normal shock decides the start or unstarts of a supersonic wind tunnel. The earlier shock oscillation studies were limited to either divergent or constant-area flow situations. In the present work, experimental studies were conducted in a fully transparent Mach 1.7 blowdown tunnel. The experimental investigations included schlieren visualization using a high-speed camera and unsteady pressure measurements. Experiments with increasing and decreasing stagnation pressures indicate a behavior similar to intermittency near bifurcations. Higher stagnation pressure was required in the upstream motion compared to that in the downstream motion. 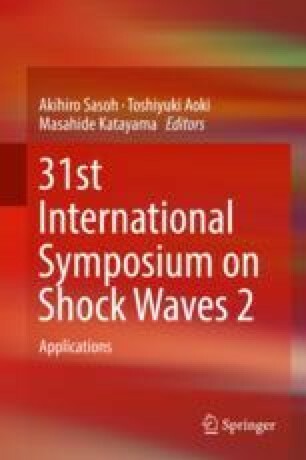 The experiments with different rates of operation are conducted to understand the rate dependency of shock oscillation. The size of the separated flow region determines the shock structure, and the behavior is rate dependent. Hence an optimum starting operation of a wind tunnel can be by increasing the stagnation pressure fast and decreasing it slowly to bring the shock near the diffuser throat.